DownloadStudio is up to 5 times faster than your web browser and 50% faster than other download managers. Includes 12 downloading tools that let you download any type of file - video, movies, TV shows, music, flash, programs, games, photos, podcasts, web sites and more. All popular web browsers supported - Google Chrome, Firefox and Internet Explorer. Mezzmo is a free, feature-packed and flexible media server for all your media files. Stream all your media files in your home. Stream them outside your home. Stream movies, TV shows, music, photos and subtitles to all popular UPnP and DLNA-enabled devices and web browsers. On-the-fly, fast transcoding. Multiple device support. Powerful organizing features. All popular media formats supported. Works with latest devices including web browsers, Samsung TVs, Sony Bravia TVs, Panasonic Viera TVs, LG TVs, PlayStation 4/3, Xbox One/360, Blu-ray players, tablets, smartphones, home theater systems, media players, Google Chromecast, Amazon Fire and many more. New! 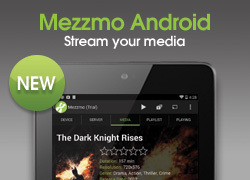 Mezzmo Android app - Install it on your Android tablet, smartphone, Android TV or Amazon Fire device. Browse	your Mezzmo library (or any other media server). Select a device in your home to stream to or play it on your Android device. Select files to stream to that device for immediate playback! You get support for all popular devices including Google Chromecast, Android TV, Amazon Fire, full playback control, photo slideshows, playlists and full metadata display.